One Fall afternoon in 2009 I sat at a table in Lower Manhattan with colleagues of mine from across the City University of New York (CUNY), where I’m a member of the library faculty at New York City College of Technology (City Tech). It was a meeting of the Steering Committee for the CUNY Games Network, a group of faculty, staff, and graduate students at the university who are interested in game-based learning in higher education. Network co-founder Joe Bisz, on the English faculty at Borough of Manhattan Community College, had laid out before us a prototype of a game he created to help teachers brainstorm games to use in their classes. Joe was inspired by Grow a Game (http://www.tiltfactor.org/game/grow-a-game/) from Tiltfactor, a game design and research lab focused on “designing and studying games for social impact” (http://www.tiltfactor.org/about/). Grow a Game consists of several thematically-based decks of cards and asks players to draw a card from each deck and use the resulting hand of cards to brainstorm a game. That day we were playtesting Joe’s new game, and we worked though several hands in order to give Joe feedback on its design. Eventually that game would become What’s Your Game Plan? (http://www.joebisz.com/whatsyourgameplan/whatsyourgameplan.html), which Joe and other Games Network members (and others in higher education) use in faculty development workshops at CUNY and beyond. In small groups, players draw one card each from 4 decks – Lesson, Mechanic, Action, and Game – and work together to brainstorm a game to teach the lesson on the card while incorporating a component of the mechanic, action, and game on the cards they’ve drawn. one of which – from the Lesson deck – was Finding Sources. I kept turning that over in my head after our meeting: I teach students about finding sources all the time in my library instruction sessions, how can I add game mechanics to that process, or turn it into a classroom game? After much thought, iteration, and both successful and failed experiments in the classroom, I created a game I called Quality Counts, a game about evaluating sources designed to be played in a library instruction session (http://www.libraryinnovation.org/article/view/182). Games in Teaching or Games for Teaching? Fast forward to summer 2011, and a CUNY colleague has asked me to give a guest lecture in a library instruction course he’s teaching at a MLIS graduate program. It’s a small but interested class and my colleague has given me ample time, almost two hours. By this point I’ve worked with games in library instruction for long enough that I have a ready supply of background material on game-based learning, including discussion of the educational research that supports its effectiveness, as well as a brief presentation on how games are being used in academic (and other) libraries. I can also share my own experiences using games in the library classroom, and specifically discuss creating and using Quality Counts. Why use games in education? There’s lots of good evidence backed by solid research that games are effective for teaching and learning. James Paul Gee, a professor of Education at Arizona State University and prominent scholar of game-based learning, notes that “good video games incorporate good learning principles, principles supported by current research in cognitive science” (2005, 34). Gee and other researchers including Mary Flanagan, Katie Salen, and Kurt Squire (to name just a few), have published prolifically on the topic of games in both K-12 and higher education. Games in academic libraries have also received lots of attention in recent years. The same summer that my colleague asked me to speak with his class, I wrote an article that reviewed game-based learning in both higher education generally and information literacy instruction specifically (Smale 2011). Gamification – using games or game features – in library services has been discussed by Bohyun Kim (2012) and others, and Mary Snyder Broussard (2012) has considered the use of digital games, specifically, in academic libraries. Assessment of game-based learning in library instruction has shown encouraging results. A recent study by Eamon Tewell and Katelyn Angell (2015) used pre- and post-tests to compare student learning in library classes that played games as part of their instruction with those that did not. Tewell and Angell found that students in the game-based sessions did significantly better on the post-test than the students who did not play games. But nearly two hours is a long time for anyone to listen to me talk about using games in library instruction. So I took a page from Joe’s book: I decided to mod (a game design term used to mean alter or build on) What’s Your Game Plan? for my own purposes, and created a version for making games to teach information literacy that I could use in my guest lecture. Playing a brainstorming game with the graduate students in this class seemed like it would be much more useful to them than listening to me talk for 90 minutes. Increasing student engagement through active learning is one of the major benefits of using games in teaching, especially in the library classroom, where student engagement can often be so challenging to maintain. Using some of my time with these MLIS students to play a game seemed like a great way to model active learning in the classroom. And since Quality Counts had ultimately emerged from our initial playtest of Joe’s game, I was confident that playing a brainstorming game could produce results that could be used in teaching information literacy. 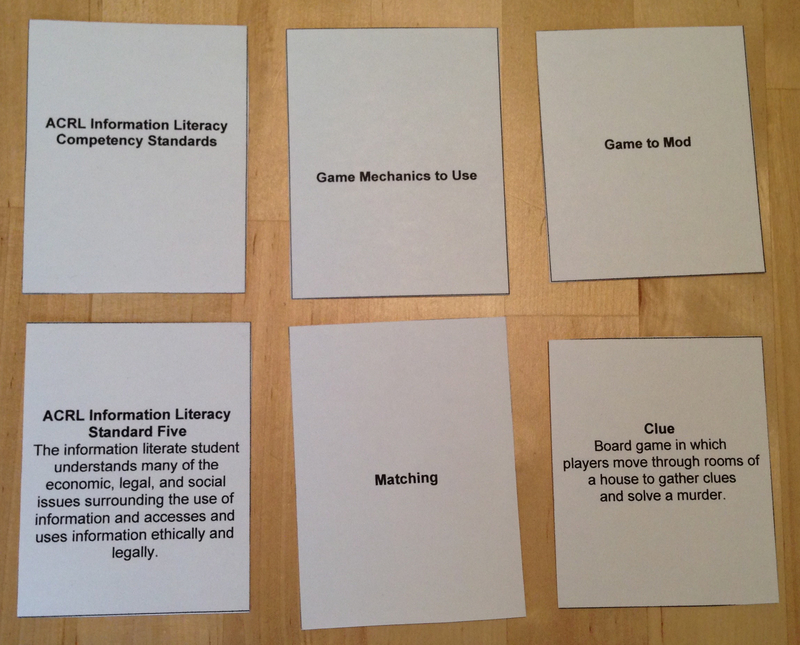 A card for each of the ACRL Information Literacy Competency Standards (http://www.ala.org/acrl/standards/informationliteracycompetency#stan) made up one deck, representing the content that the resulting game would have to teach. 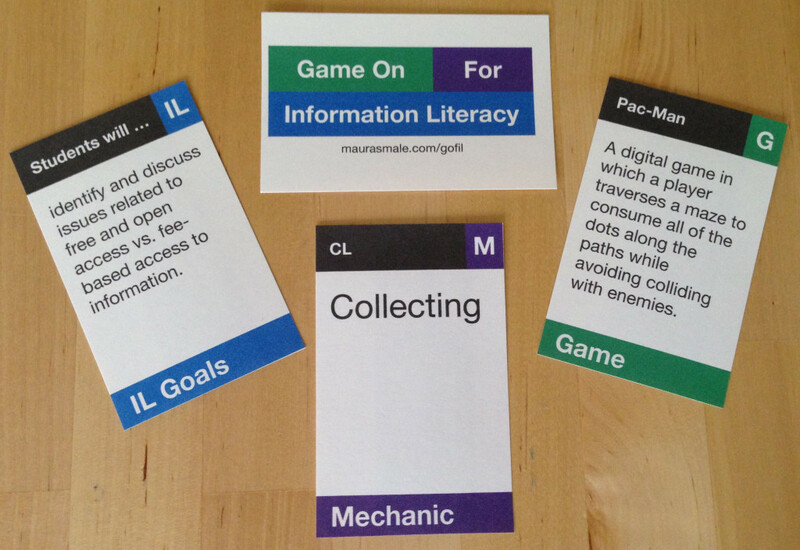 I developed this game when the Standards were still current, and have not (yet) reconsidered the information literacy competencies in light of the newly-approved Framework for Information Literacy for Higher Education (http://acrl.ala.org/ilstandards/). With only five Standards that meant there were only five cards in the deck, but the class where I was guest lecturing was a class of only about a dozen students and since players form small groups to play the game, a deck of this size was sufficient. I collapsed Joe’s ideas for individual Mechanic and Action decks into one deck, which I named Mechanic. When playing What’s Your Game Plan? I had observed that sometimes players were confused about the difference between the two decks, and merging them meant that my game would have three decks total, which I suspected would be easier to facilitate during class. I also made sure that the mechanics I selected were or included active verbs that are generally familiar, for example, common game actions like collecting, running, and role play. This reduces the amount of explanation needed before starting to play the game, and helps demystify the jargon that can sometimes seem like a barrier to playing games for those who do not identify as gamers. The Game deck features well-known card, board, digital, and other games, and includes a description of each. Though I’ve tried to select games that will be easily identifiable by many people of a range of ages who have lived in the United States, everyone has had a different experience with and preferences for games in their lives. It’s thus not unusual for at least one player in a group to be unfamiliar with the game on the card that the group has drawn. Often the description of the game included on the card as well as the other group members describing the game to that player enables the group to continue, but if not, the group may elect to draw a different card from the Game deck. Gameplay is fairly straightforward. Divide the players into groups of 3-4 and ask each group to draw 1 card from each deck: Information Literacy Standards, Mechanic, and Game. Players spend 15-20 minutes brainstorming a game to teach the Information Literacy Standard on their card using some aspect of the Mechanic and Game on their cards. It’s important to note that the aim of the game isn’t to create an information literacy-inflected version of the game on the card they drew, e.g. information literacy checkers. The game card is there to provide inspiration and encourage players to think creatively about a game they might develop. After 15-20 minutes of brainstorming and discussion, each group reports back to everyone. They discuss both the game they created, including rules, materials required, gameplay, and win conditions, as well as their brainstorming and creation process. MLIS students in the classes I’ve used this game with have reacted positively to the game – it gets them thinking about how they might incorporate games into library instruction, and both the successes and challenges they encounter during gameplay provide fruitful material for class discussion. As I used the game in several classes one problem soon became apparent. While the Information Literacy Standards provide ready content for this game, each overarching Standard is much too large and encompasses too much detail to be used effectively to create a classroom game. 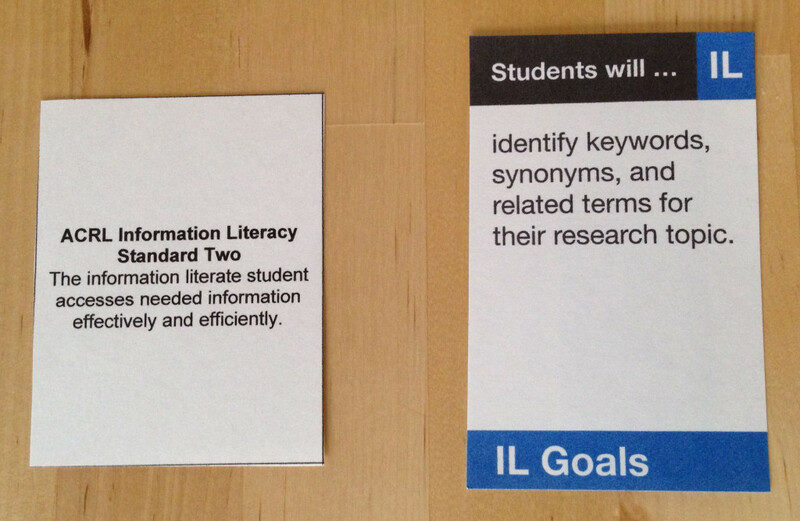 As I continued to work with the game I realized that I needed to be more specific, so I considered the Performance Indicators and Learning Outcomes for each standard to create 20 Information Literacy Goals cards. Each goal is phrased as a student learning outcome, which makes it easier both to brainstorm a game as well as to consider how to assess student learning after students play the resulting game in the library classroom. Changing from the larger, somewhat unwieldy Standards to smaller, more manageable Information Literacy Goals had an additional bonus: I was able to create 20 distinct cards for the IL Goals deck. I also increased the number of cards in the Mechanic and Game decks, and the current version of the game, which I named Game On for Information Literacy, has three decks of 20 cards each. This expansion has made playing the game in classes and workshops a bit easier as it offers more flexibility in terms of the number of participants as well as increases the possibility that participants will be familiar with the games in the Game deck. 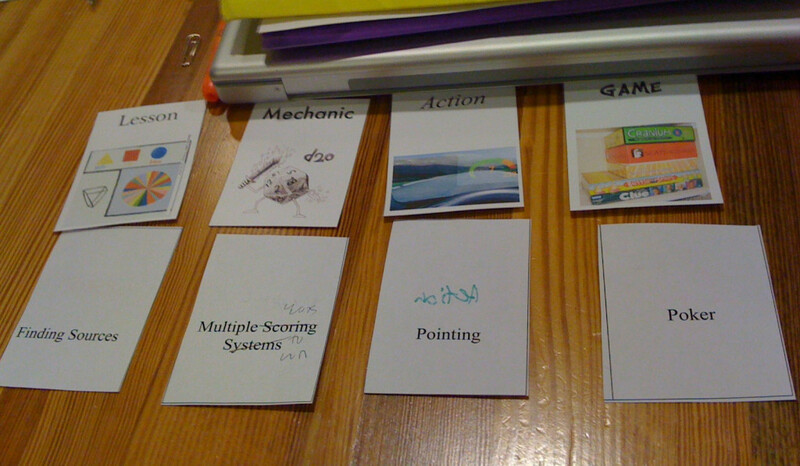 In January 2014 I tested out the new deck, freshly-printed on cardstock with a somewhat fancier design, at a professional development workshop for instruction librarians at a local university. For this workshop I also used a worksheet to facilitate the report back after the groups had brainstormed their games. The worksheet is modded from a worksheet used in a faculty development game I participated in creating as part of my work with the City Tech OpenLab, an open platform for teaching and learning at my college (https://openlab.citytech.cuny.edu/openpedagogyopenlab/2014/05/30/open-digital-pedagogy-at-eld/). 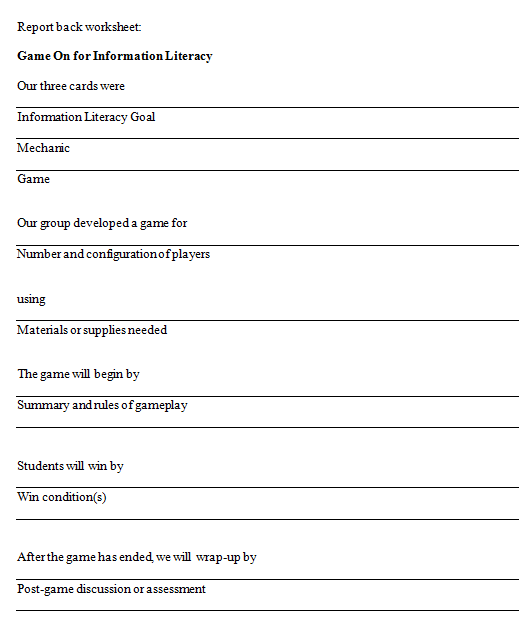 Inspired by the popular Mad Libs word game, the worksheet prompts groups to record the cards they drew, materials and supplies needed for the game, the rules and gameplay, how students win, and post-game discussion or assessment. The OpenLab team found that using the worksheet streamlined the report back process, especially with a large group, by keeping workshop participants focused on recording their game notes and sharing the details of the game they created. Feedback on Game On for Information Literacy from the instruction library faculty I worked with, including the new deck and the report back worksheet, was also positive. They appreciated the opportunity to engage in an activity – as opposed to just sit back and listen – and to leave the workshop with a game (or the beginnings of a game). I’ve also used the game in smaller professional development settings, including a workshop with only seven people in which we all played together as one group. This workshop produced a draft of a citation game that participants made available online (http://infolit.commons.gc.cuny.edu/lilac-events/from-stale-to-stellar-april-2014/gaming/), and that one participant has continued to develop and implement in the time after the workshop. Version ?.0: What Will You Create? Playing games for professional development is a terrific way to engage librarians, students, faculty, and others in thinking about pedagogy. Many librarians find themselves in front of a classroom as part of their job responsibilities, and not all have a background in teaching or LIS coursework in instruction. Using this game (or others!) can also offer opportunities for creativity in the workshop itself. As I’ve often seen when using games in information literacy instruction with undergraduates, introducing gameplay into a workshop injects an element of fun, which can be creatively productive. Though any game can be tweaked and improved, I continue to use Game On for Information Literacy as it stands at Version 2.0 in professional development workshops with great results. With the game in its “final” form, I’ve made all game materials available online (http://maurasmale.com/gofil) so that others can use them. The game cards and report back worksheet are available in both PDF as well as two modifiable formats – EPS and Omnigraffle – for further customization. All of the materials have a Creative Commons Attribution 4.0 International License (http://creativecommons.org/licenses/by/4.0/) and are free to download, remix, and share. For best results and durability, the cards should be printed on cardstock if possible. If you download and use – or mod – Game On for Information Literacy, please get in touch, as I’m interested to hear your feedback. I hope the game inspires your creativity in the library classroom. Broussard, M. J. S. (2012). Digital games in academic libraries: A review of games and suggested best practices. Reference Services Review, 40, 75-89. Note that downloadable and editable card templates as well as Word and PDF versions of the worksheet are available at http://maurasmale.com/gofil. It might be helpful to reassure players that the gameplay is meant to provide an introduction to game-based learning for library instruction – there’s no expectation that 15 minutes of brainstorming will produce a fully-formed, complete game (though if that happens, terrific!). Fantastic, Maura! I totally understand how the IL cards were a breakthrough. It’s a smart decision to narrow what faculty need to think about when making a game, considering that even in an hour class, if you’re trying to teach a new concept/procedure, it must be very specific! This is a great, and endurable mechanic that should be widely applied. Perhaps you could create a portal where users in specific domain areas can create their own cards? The popular CardsAgainstHummanity (http://cardsagainsthumanity.com/) allows users to generate their own deck. I’m curious to see what kinds of decks academics generate!